This is an annual tropical climbing vine with delicate yellow flowers and tender, deeply lobed leaves. Its oval and long, textured green fruits are crunchy and bitter, used in Chinese, Indian, Filipino and Southeast Asian cooking. The leaves are edible: used in traditional medicine and also cooked as a vegetable. Folkloric uses include the treatment of diabetes, cancer, stomach and skin ailments, intestinal parasites, spleen and liver problems, burns and wounds, and a host of other ailments. If you can’t find bitter melon at your local Asian grocery, you can plant it yourself. If possible, mix in compost or dried manure where you will plant in the garden. Bitter melon thrives in soil that is rich but drains well. Choose a spot in the garden that receives six to eight hours of sunlight every day. (Optional) Soak the bitter melon seeds in water for 24 to 48 hours for uniform sprouting. Plant 2 seeds about 1/2″ in the soil. Space the plants about 2 feet apart in a row. This allows sunlight to reach the lower branches. Water the soil regularly. The ground should remain moderately moist but not soggy. Put in a trellis or sticks about 4 to 6 feet tall. Bitter melon grows best on a trellis so that the fruits do not touch the ground. 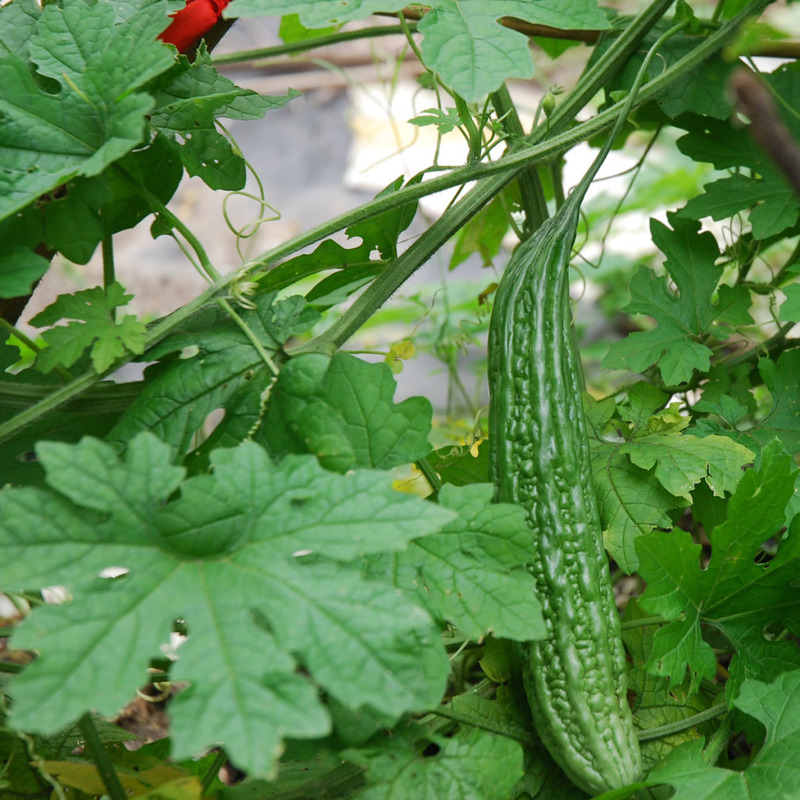 Once the fruits start to form, look for gourds that are light green, firm, juicy and crunchy. Harvest these for cooking. Let some fruits fully ripen (rind will be yellowish) for seeds. The seeds inside will be surrounded with a sweet red pulp, excellent for snacking or salads. Save these seeds for the next crop. While there are hundreds of recipes out there, one simple recipe I use is to cut the green fruit lengthwise in half, remove the seeds and fiber inside with a spoon, and then slice the rind diagonally into thin strips. I then stir fry these in coconut oil, add scrambled eggs and then season to taste. To lessen the bitter taste, soak the cut rind in brine an hour or so before cooking.